I‘ve previously mentioned that the most important thing I learned from 37 years in the business world is that in large organizations of every kind, almost all valuable work is done by workarounds, i.e. people on the front lines doing what they know is best for the organization, even when this ignores or (often) contravenes what they’ve been told to do (or not to do) by senior executives. Or which contravenes the executives’ surrogate, the policy and procedures manual, which is now substantially embedded in the software these poor front-line employees have to use, and which forces them to tell you “sorry I am not authorized to do that for you; is there something else I can help you with today?”. This is a cynical view, but it actually makes sense when you understand the nature of complex systems. No one can know what to do or how to effectively intervene in large, complex systems — there are far too many variables, too many moving parts, and too many unknowns, and the further removed you are from the customers, citizens or clients of the organization, the less likely you are to know what they want or need, or the cost/benefit of giving it to them. 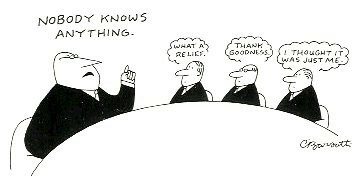 The belief that ‘experienced’ executives, ‘experts’, consultants or other highly-paid (often obscenely so) people know anything more about what to do is sheer hubris. As Charles Handy has pointed out, modern capitalism (and the modern organizational model) are inherently anti-democratic. He also noted that, as any student of history can tell you, nobody gives up power voluntarily. And as Joel Bakan’s The Corporation explained (and Hugh Macleod’s cartoon above satirizes), large profit-driven organizations are necessarily pathological. So how does this weird power dynamic in organizations arise? 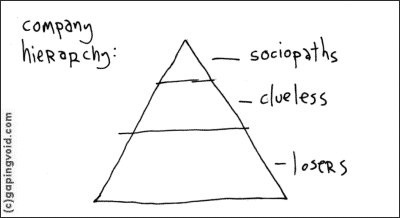 If hierarchy is so unhealthy, why is it the prevailing model in almost all human social systems and organizations? My theory is that it arose to exploit the fundamental human loathing for complexity and the fear-driven desire to believe that everything can be controlled. Shareholders don’t want to hear that “nobody knows anything”; they want to know that their investment is going to rise in value. As organizations grow in size, they inevitably grow exponentially more dysfunctional. Paradoxically, this growth also conveys the power to outspend, out-market, and acquire smaller, more innovative, more agile, customer- and citizen-focused organizations. Acquisitions of small companies by larger ones almost always destroy value (any honest M&A practitioners will tell you that ‘economies of scale’ don’t actually exist — what exists is ‘power of scale’ — and oligopoly). Similarly, the prevailing neoliberal ideology (under which lies this loathing of complexity and diversity and the desire for everything to be simple and standardized) has led to the centralization and amalgamation of small organizations, schools, hospitals and municipalities into massive, dysfunctional, hierarchical ones, in the mistaken belief this is somehow fairer and more efficient. What then arises in hierarchical organizations is a strange co-dependence between those at the top (with the power and wealth) and those at the bottom. To reach the top in large complex organizations (if you buy my ‘workaround’ argument above) requires a sufficiently large ego and hunger for power to be willing to self-promote, lie, betray, and claim credit for the work of everyone else, and shift blame for failures elsewhere. Only sociopaths have the right stuff for this. But they hold this power with the collusion of the ‘clueless’ middle-management underclass beneath them. If you are in a comfortable middle-management position (most likely doing completely valueless administrative and pencil-pushing work), you live in fear of making a mistake that would allow your sociopathic boss to fire you. So basically you don’t want to have to make any decisions for yourself. You want the boss to tell you what to do and how to do it. And that’s exactly how the sociopath bosses like it. The system of collusion self-perpetuates. It’s precisely analogous to the co-dependence that evolves between sociopathic, abusive parents (usually men) and their victimized family members. So what about the ‘losers’ at the bottom, the ones actually doing the workarounds to serve customers, citizens and clients that actually have some value? Up until a generation ago, they fell in line beneath the middle-managers for the same reason middle-managers kowtow to ‘executives’ — job security. But now there is essentially no job security, nor ‘upward’ mobility, in the workplace or anywhere else in our society. There are already too many middle- and upper-level people earning too much money doing nothing of value, in every system in our society (corporations, schools, government administrations, even large non-profits and NGOs). These systems have all ‘grown’ not through innovation and smart management but by exploiting cheap resources, cheap foreign labour, and (as social and labour rights are eviscerated) cheap, desperate domestic labour. So now the front-line people, realizing there is no future for them in the organizations they work in, change jobs often and indifferently, relearning the essential workarounds in each new organization they join. They couldn’t care less about the rot above them in the organizations they work for. They are already, essentially, as ’employment’ benefits have all but disappeared, independent contractors. They are still doing just about all the work of any value in our society. It’s a very sick, and unsustainable system, and it mirrors the malaise in our overall society. And there’s one other factor that makes the picture even worse: Nearly every study of factors that correlate to high rates of crime has identified inequality of wealth and power as the factor with the highest-correlation: in organizations, municipalities and nations with a few obscenely rich and powerful people and a massive underclass, crime is inevitably high. Once inequality and crime reach a certain level the entire political, economic and social fabric of the entity starts to break down. Paradoxically, when these systems collapse, the propensity of most people (being change-averse and ignorant of any alternatives) is to try to recreate what has been irreparably broken. You see this in many countries which have ended up with worse regimes after collapse than the ones that preceded it. Executives who presided over organizations that collapsed end up, over time, in charge of other organizations. We keep perpetuating the madness. When I became involved, after retirement, in the development of Group Works, the pattern language for more effective group process, I was keenly aware of this propensity, and of the ghastly, prevailing power dynamics (and the ignorance of other ways of being, working and collaborating with other people in groups) working against the emergence of better models of behaviour. I was therefore not surprised to discover how huge a challenge it is for many organizations to consider processes and tools that are inherently egalitarian and that mandate a power shift from those at the top (who see ceding power as a sign of weakness), to those in the middle (who don’t want the responsibility that comes with power) or the bottom (who raise their eyebrows at any suggestion that any real shift of power to them could ever happen, and who feel more like temporary contractors than employees in any case). Let me temper my characterization of people struggling with this dysfunctional power dynamic a little. I appreciate that we’re all doing our best, against truly dreadful odds — our horrifically overpopulated, desolated, resource-exhausted planet has left almost everyone damaged, malnourished and starved (in one way or another), and overworked, and hence to some extent mentally ill and struggling to heal themselves and those they love and care about. Even the psychopaths cannot be other than who they are, and they have often suffered from abuse in past as bad as, or worse than, the suffering they now inflict on their co-workers, families and communities. The political, economic and social systems we now struggle with have evolved in this atmosphere of illness, suffering, desperation and imaginative poverty. Our change-aversion is understandable, and sometimes it is just easier to be ‘clueless’ or walk away than try to change a system that has ‘successfully’ evolved to defeat all attempts to reform it, even if in the longer term it is unsustainable and will inevitably collapse on its own. I don’t believe these systems, institutions, governments, or our entire industrial civilization can be reformed, and I’ve long ago resigned from trying. Cultures (of organizations or societies) evolve as the collective expression of their members’ beliefs and behaviours; they cannot be created, re-created or reformed. But in the spirit of my Resilience Framework I think there is great value in us having a conversation, even while struggling with our industrial civilization’s oppression and impending collapse, about how we can realize what is actually happening, act at a local level to help ourselves live with and heal from its excesses, and begin to liberate ourselves from its clutches. Our existing languages (despite their fascinating etymological roots) have evolved to be instruments of power — tools to convey instruction and command information, to coerce, to oppress, to obfuscate, and to mandate and ensure obedience to hierarchy and established processes, no matter how dysfunctional they may be. These languages are ill-suited to the nuances of expressing how things actually work in complex situations, or appreciation of ambiguity and uncertainty, or the value of incremental adaptation (workarounds) instead of ‘decisive’ action. Those of us working on the relatively powerless edges of industrial civilization have naturally evolved some new ‘language’ to convey what we now realize is important to understand and speak about, language that employs terms like: ‘commons’ (a dirty word in the language of free-market capitalism), community, the sharing economy, generosity, relocalization, permaculture, complex adaptive systems, emergence, invitation, appreciation, transparency, preparedness, story, iteration, intention, improvisation, coping, meaning, resilience, joy, presence, equanimity, gratitude, self-awareness, healing, modelling, and trust. You don’t hear these words much in the industrial workplace, but if you listen, you’ll hear them more and more in the communities and groups that are working around it. There’s a shift happening, a new foundation being created for the world that will be left when the old one crumbles away. If we’re fortunate — if we have the time to heal, prepare, rethink and experiment, the wisdom not to try to replicate old failed systems, and the self-awareness and imagination to appreciate what is good for us (and all other life on Earth) — this new foundation will have a very different, natural, ancient power dynamic. Never too early to start to develop the language to do that. Thanks to Cecile Green for the ‘power-full’ discussion that prompted this article. She does not share my cynicism. This entry was posted in Preparing for Civilization's End, Working Smarter. Bookmark the permalink. Great post Dave! Experienced this, see it evolving and doing my best to evolve it as you state. Yes! Organisms that grow under stressful conditions – like plants that don’t get enough light – exhibit qualities that are not viable in their normal environment. The qualities you describe are those of a society (according to Aldous Huxley, Brave New World,) stressed by urbanisation. Huxley talked about the longing for the good order that turns into a solution like that of insects. In other words, stressed by our own crowding together we respond with insect like behaviour. It’s frightening how much of Brave New World has become reality including the creation – on purpose- of an underclass. I read your post right after a New York Times article about Tony Hsieh’s struggles to eliminate hierarchy at Zappo’s: http://www.nytimes.com/2015/07/19/business/at-zappos-selling-shoes-and-a-vision.html. As you explain, people have become conditioned to fear their bosses, so they’ve developed work habits meant to help them avoid making decisions. Another problem the company is having is determining how to hire, fire, and pay people in an organization with no job titles and fluid roles. Unsurprisingly, the mainstream media are treating Hsieh’s experiments as a joke. I hope he and his colleagues continue trying. … Develop another language, its semantics, its sense of horizon, of possible-horizon. (Of Utopia-language -esthetic/moral). And the sea of projects -Resilience Framework. In so far as living in an alternate senti-thinking. Absolutely, unequivocally true. I experienced it every day in my working career, no less? It’s also possible that hierarchies come into existence naturally as the energy throughput of a complex system increases, because hierarchies provide the most efficient way of containing, directing and using that throughput. People with particular psychological qualities find homes within the hierarchy at a level that is largely determined by their the intensity of their neurotic need for status. Wonderful, thoughtful post Dave, as usual. oops, hit post before I was finished…the last part of your post is really on target, if we want organizations that are created from below to meet grassroots and community needs, we most certainly need different structures and different language for those structures than what we currently have, which serve the top down interests of profit making and control…are you at all familiar with the Sapir-Whorf Hypothesis? Thanks for all the comments and thoughts here. Sue, I’m familiar with Sapir-Whorf but not entirely comfortable with it. At its extreme it’s been used to argue e.g. that indigenous people could not ‘see’ European ships because they had no word/concept for them, which seems a bit ludicrous to me. As a phenomenologist I believe that things (or at least processes) exist independent of conscious perception of them. But I do appreciate that our language (as an instrument of culture) has a powerful influence on what we believe and what we do (and don’t do). Just as it’s almost impossible for people who have lived their whole lives in cities to appreciate wilderness, it’s really hard to appreciate things we have no words for, since it’s largely through words that we ‘make sense’ of things. Excellent posting. A breath of fresh air and wonderful to find a piece that articulates feelings and thoughts that were buzzing around in my head. Thanks. Dave, you seem to be overlooking the concept of exchange and the corollary use of money in our culture. Mr. Pollard (Dave), I’m very impressed. You are very close to saying (out loud, to the general public) exactly what is wrong. The only thing hindering you is your (lifelong societal indoctrination?) optimism for the future of the hierarchical, nation-state-civilization societal template. The “hope springs eternal” belief that this organizational standard can/will be perfected is not a virtue, it is a handicap. You put your finger right on the largest structural fault of hierarchy: that hierarchy is extremely vulnerable to psychopaths/sociopaths (whichever of the two words you prefer, and I lump in very low empathy people, “near-psychopaths”, along with pure psychopaths because their effect on society is roughly the same). The sociopath is one of nature’s creations. They’re just another personality type that proved (genetically) successful within the small-group dynamics of our long Hunter-Gatherer societal history (which accounts for over 99% of human history). But the fact that, on the giant roulette wheel of human genetics, they’re set up to only occur in very limited numbers (about 1% of humanity) should not be overlooked because it speaks to the danger they manifested even to those early, small societies. The genetic forces slowly designed humanity and eventually delivered us to the apex of all the planet’s species as the one and only “fully societal” species. And while Empathy (it deserves a capitol “E”) is without doubt the indispensable structural latticework upon which all society is built, the genetic forces found, with their luxury of time and opportunity for tens of thousands of iterations of trail and error, that a society could bear a small number of empathy-free individuals and still hold its own against other societies. In other words: the genes found the sociopath to be a good bet for success in basic reproduction, but also saw that he was very dangerous/destructive societally, so this trait was deployed on only a very limited basis. Under the conditions/parameters extant within pure-egalitarian, small-group Hunter-Gather society the sociopath was a dangerous enough player that the genetic forces found it necessary to limit his occurrence to just 1% of the population. With the (very sudden) shift from egalitarian to hierarchical societal organization humanity accidentally created an “invasive species” scenario. The sociopath is that invasive species and positions of power/control within hierarchy of any type, be it governmental or corporate, is the environment. We are experiencing the results of an infestation. It’s amazing what just a few percent of an overall population (pure sociopaths + the very low empathy people) have accomplished with the power/control concentrating effect of hierarchy. Not at all cynical and, actually, something identified more positively by John Seely Brown and Paul Duguid in their 2000 book The Social Life of Information. They observed that ANY organisation functions AT ALL by the systematic, organisation-wide, socially communicated breaking of the rules by which it is assumed to operate. They also found that workplace social dynamics are so strong and so particular that it was impossible to transfer best practise literally across the road from one building to another in the same company in their case Xerox. This fact has been understood for a couple of generations at least by the union movement, especially in the UK where they realised that, rather than go on strike and lose pay, they would simply “work to rule”. ie, follow every single procedure, to the letter, in triplicate as required etc etc etc. The corollary of this is that, since ERP or other organisational and operational systems are based not on how the organisation actually functions, but on its rule book, those who implement them are, in effect, forcing their company to work to rule. Thanks for this post. I wanted to share an experience that speaks to the first part of the post. About a decade ago, I had a short stint in a middle manager position for a large well-known international humanitarian NGO working in the field with the post-conflict situation in Chechnya. At the time, there was supposedly a risk of being kidnapped as a foreigner and the conventional wisdom was that the region was very unsafe for Westerners. In my decade of living and working in Russia, indeed working in that region I felt more unsafe than I ever had before or since– but not because of the situation on the ground. Rather, it was my sociopathic Western boss who made the workplace a living hell. She is an extremely sharp person, someone who has done great relief work around the world. That truth, however, was coupled with the fact that she was *extremely* manipulative, controlling, and unkind. She was so skilled at navigating bureaucracies that at least on one occasion when her immediate supervisor at HQ crossed her she was able to get that boss either fired or reassigned! She had someone in the office whose job it was to spy on everyone and report everything to her in her absence. So, the level of trust was extremely low in the office. Our organization was one of the few- and maybe the only- international humanitarian NGO’s operating in the region who hadn’t chosen a local clan as “protection.” Allying with a clan in the best of circumstances could mean that the organization could have operational stability and could get things done…at the cost of heavy-duty nepotism and corruption. She was sharp and capable enough to do without this kind of support, so sharp in fact that she could understand people even though she didn’t know the language…she was that good a reader of body language. Interestingly, there was still a not-significant amount of corruption in our organization. I later found out that one of my subordinates stole $7,000; the buyer for our organization also embezzled thousands. I also learned that this expat boss stole thousands to buy herself a really nice fur coat in Moscow. This kind of stealing by expats working for these international humanitarian organizations was not unheard-of. Second-hand I heard that some Ingush people would express pity for these foreigners who in order to make ends meet had to travel to far-off lands and embezzle money. I stayed in my position for the duration of the contract but at a huge cost to my health. I was physically shaking much of the time at work from fear and rage…to the point that my skin turned yellow. What I saw was so shocking that when the contract ended, that for a time I seriously considered contacting a journalist to do a story on all of this. So today I *never* donate to international NGO’s. Interesting how the two main emergent threads of this blog (the state of the world, and human nature) keep overlapping. I don’t think I could bear being an optimist about the state of the world, or a pessimist about human nature. Joyful pessimism ISTM is the only way to cope sanely with day-to-day life and learning. It does put a bit of a damper on the energy of rants, however, when you start with the supposition that we’re all doing our best, and that that’s just not enough to “save” us. I want my employees / contractors to be clones of me. I want to provide the best products and service to my customers without harming the business. I want them to do what I do: figure out, before something goes wrong, the best way to do x, y and z. And when something does go wrong, figure out the best way (best for the customer) to fix it. Happy customers lead to more business. More business leads to job security and more money for all of us and better health for more of the world’s population. After a lifetime of working in small companies, I put in a stint at a very large corporation for a few years. Your commentary puts into words exactly what I subjected myself to. As a matter of fact, it appears you must personally know my immediate manager I had at that job, as the 7th paragraph describes him precisely. PRECISELY! Brilliant article — thank you.